If you’re a semi-serious amateur astronomer, chances are you’ve heard of a variable pair of stars called SS Cygni. When you watch the system for long enough, you’re rewarded with a brightness outburst that then fades away and then returns, regularly, over and over again. Turns out this bright pair is even closer to us than we imagined — 370 light-years away, to be precise. Before we get into how this was discovered, a bit of background on what SS Cygni is. As the name of the system implies, it’s in the constellation of Cygnus (the Swan). The pair consists of a cooling white dwarf star that is locked in a 6.6-hour orbit with a red dwarf. 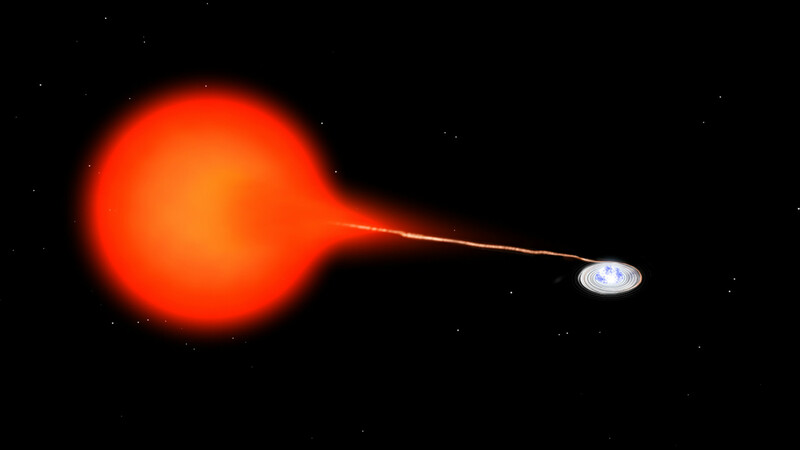 The white dwarf’s gravity, which is much stronger than that of the red dwarf, is bleeding material from its neighbor. This interaction causes outbursts — on average, about once every 50 days. Previously, the Hubble Space Telescope put the distance to these stars much further away, at 520 light-years. But that caused some head-scratching among astronomers. “That was a problem. At that distance, SS Cygni would have been the brightest dwarf nova in the sky, and should have had enough mass moving through its disk to remain stable without any outbursts,” stated James Miller-Jones, of the Curtin University node of the International Centre for Radio Astronomy Research in Perth, Australia. Astronomers call SS Cygni a dwarf nova. When comparing it to similar systems, astronomers said the outbursts happen as matter changes its flow speed through the disc of material surrounding the white dwarf. “At high rates of mass transfer from the red dwarf, the rotating disk remains stable, but when the rate is lower, the disk can become unstable and undergo an outburst,” stated the National Radio Astronomy Observatory. So what was happening? To again look at the distance of the star, astronomers used two sets of radio telescopes, the Very Large Baseline Array and the European VLBI Network. Each set has a bunch of telescopes working together as an interferometer, allowing for precise measurements of star distances. Scientists then took measurements at opposite ends of the Earth’s orbit, using the planet itself as a tool. By measuring the star’s distance at opposite sides of the orbit, we can calculate its parallax or apparent movement in the sky from the perspective of Earth. It’s an old astronomical tool used to pin down distances, and still works. “This is one of the best-studied systems of its type, but according to our understanding of how these things work, it should not have been having outbursts. The new distance measurement brings it into line with the standard explanation,” stated Miller-Jones. The results were published in Science on May 24. Um…”Where did Hubble go wrong?”…I didn’t. I just lost some weight and have to calculate a pair of slacks. Too close for comfort? We’ll have less time to react when it eventually blows! Elizabeth Howell wrote, in reference to parallax-derived measurements: “Its an old astronomical tool used to pin down distances, but it still works”. Of course it still works, I thought cheekily, after all, we’re still orbiting the Sun (yes, yes, I know that Ms. Howell meant to convey that it is still a useful measurement tool after all these centuries). baselines from the relative motion of our solar system through the Milky Way for parallax measurements of very distant targets? I think that our Sun orbits the Galaxy center at some 250km/sec. That kind of velocity can generate a very long baseline after awhile. Has this method of parallax measurement been used already or, more likely, am I just missing something? Earth-orbit allows remeasure every year, galactic orbit would require some 100 million years before we could remeasure. That makes galactic orbit/speed unpractical and error-prone. And it is the ability to remeasure that improves the significance over time. I was aware that a single galactic orbit would take an inordinate amount of time, but I had thought that by using two points along the orbit (eg. 5 years apart), one might be able to create a suitable baseline. Based on your post, it seems as though such as though such an approach would be too error-prone, and thus useless. Thanks again! Previous PostPrevious Cold Fusion Experiment Maybe Holds Promise … Possibly … Hang on a Sec …. Next PostNext Rocky Alien Planets: What The Heck Is On Their Surfaces?